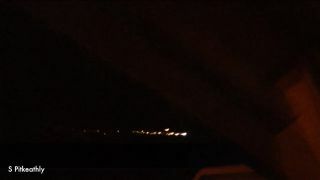 Night sky watcher Stuart Pitkeathly posted a video online reportedly showing a meteor breaking up over Dalbeattie, Scotland, in this southwestern part of the country. Video posted on YouTube September 21, 2012. A spectacular meteor wowed stargazers across the United Kingdom Friday (Sept. 21) when it flared up and shattered into pieces in a surprise display of celestial fireworks. The fireball was spotted by observers across Scotland and northern England as well as Ireland Friday night, according to BBC News and other media reports. Many observers captured views of the meteor on camera, including skywatcher Stuart Pitkeathly. "At first, I thought it was a helicopter search light rising above the trees on the horizon as I was looking out my window," Pitkeathly, who lives in the town of Dalbeattie in southwest Scotland, told SPACE.com in an email. "Then as it came closer there was a burst of blue-green light and this was all in a few seconds. It then appeared to have a smoke like tail billowing from the bright fireball." Pitkeathly's video of the Sept. 21 meteor shows what appears to be a fireball created as a small space rock breaks apart in Earth's atmosphere. Pieces of the meteor can easily be seen separating from the main body in his view. Friday's meteor led many witnesses to wonder if it was sparked by a man-made piece of space junk falling out of orbit. But some experts have conclusively tied the event to a naturally occurring space rock burning up in Earth's atmosphere. Veteran satellite tracker Marco Langbroek, who runs the blog Sattrackcam Leiden in the Netherlands, wrote today (Sept. 24) that the fireball was definitely a meteor. Langbroek used sighting reports to determine the fireball's trajectory and studied videos posted by witnesses to determine how long it lasted. "This quick back-of-the-envelope reconstruction therefore shows that this must have been a meteoric fireball, quite likely of asteroidal origin, and we definitely can exclude a satellite re-entry," Langbroek wrote in his latest blog post. The Earth is often struck by tiny space rocks, which generate meteor light shows as they streak across the sky. Several times a year, the remains of comets or asteroids flare up in Earth's atmosphere to create dazzling meteor showers, such as the recent Perseid meteor shower in August. Pitkeathly said he was surprised by the amount of public interest in Friday's meteor event after he uploaded the video to his YouTube website. "The interest for what was captured has been amazing, and thousands of people across the UK and Ireland were eye witnesses to this on what was a superbly clear night great for stargazing," he said. A would-be meteor in space is called a meteoroid. Only when it flares up in the night sky does it become a meteor. Any remains of the object that reach the ground, meanwhile, are called meteorites. Earlier this year, a rare daytime fireball surprised U.S. observers in California and Nevada when it unleashed a sonic boom that some mistook for a small earthquake. The meteor was caused by a minivan-size asteroid and created several meteorites that NASA retrieved in a follow-up search. Editor's Note: If you snapped a photo of UK fireball on Friday, Sept. 21, and would like to share it — or any other night sky picture — with SPACE.com for a possible story or gallery, please contact managing editor Tariq Malik at tmalik@space.com.